If your business processes copper bus bar or other types of aluminum or steel bar stock, EHRT offers precision punching and bending machines that will help you save time, reduce scrap and increase the profitability of your business. Thanks to innovations like their proprietary spring-back compensation, simple “what-you-see-is-what-you-get” software interface, and quick-change punching tools, EHRT bus bar equipment is relied upon by small businesses and international corporations alike. Read on to learn more and see video of bus bar punching and bus bar bending machines from EHRT, and contact us today to request a quote. 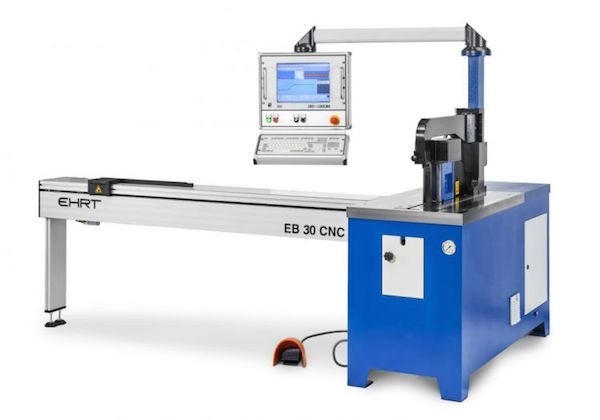 EHRT is known for producing the most accurate bending machines on the market. So whether you’re bending copper bus bar, steel bus bar or aluminum, EHRT makes it easy to create precision bends each and every time. Available in both Standard and Professional models, EHRT bending machines feature a hydraulic drive system and exclusive tooling with spring-back compensation technology that ensures accuracy to within ± .20°. When combined with easy-to-use software and simple machine setup, this means dramatically reduced scrap, increased productivity and higher profitability for your business. If you’re interested in learning more about EHRT bending machines, contact us today. EHRT HoleCut CNC punching machines provide fast, highly-accurate punching of copper bus bar and other flat bar materials. With tooling to create holes, slots, chamfers and more, they’re the perfect machine for small and medium runs of parts. With both Standard models and Professional models, and a variety of customizations available, there is an EHRT punching machine that will suit your unique needs. In addition, thanks to EHRT’s exclusive PunchPro nesting software and the accuracy of their machines, the HoleCut line of punching machines will help your business reduce costly scrap and maximize efficiency. If you’re interested in learning more about EHRT punching machines, please contact us today.